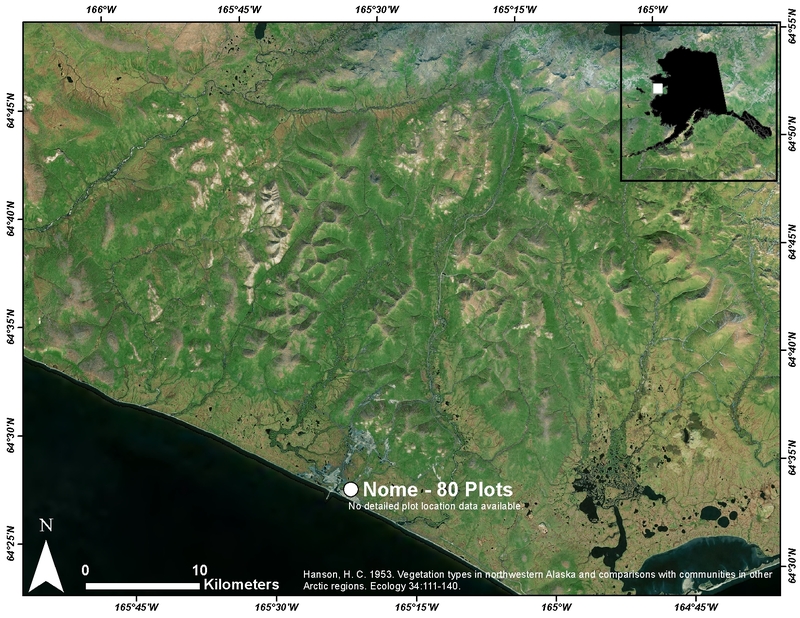 This data set provides environmental, soil, and vegetation data collected in July and August 1951 from 80 study plots in the Nome River Valley about 10 miles northeast of Nome, Alaska on the Seward Peninsula. Data includes the baseline plot information for vegetation, soils, and site factors for the study plots subjectively located in plant communities that were found to occur in 5 broad habitat types across the glaciated landscape. Specific attributes include: dominant vegetation species and cover, and soil characteristics, moisture, and organic matter. This product brings together for easy reference all the available information collected from the plots that has been used for the classification, mapping and analysis of geo-botanical factors in the Nome River Valley and across Alaska. This data set includes three data files in *.csv format and one companion file. This data set includes three data files in .csv format and one companion file. File contents are described in Table 1. Nome_Environmental_Data.csv Comprehensive set of environmental characterization data for Nome research plots including descriptive site factors. Most measurement data have been processed to provide values at a common 10 cm depth. This measurement comparability facilitates analysis of geo-botanical relationships across Alaska. Data Descriptions: The column names, their units, and descriptions for each of the .csv data files are listed below. PUBLISHED_PLOT_NUMBER TABLE_NUMBER-PLOT_NUMBER Roman numeral corresponding to the table number from Hanson (1953) and plot number where the soil was sampled. Each table provides data for a different site in the vicinity of Nome, Alaska. TABLE_PLOT_NUMBER TABLE_NUMBER-PLOT_NUMBER Roman numeral corresponding to the table from Hanson (1953) and plot number where the soil was sampled. Each table provides data for a different site in the vicinity of Nome, Alaska. * Cover codes are applied based on a modified Hult-Sernander species abundance scale where: 1 (covers less than 1/6 of the area or 4 percent), 2 (covers 1/16 to 1/8 or 9 percent), 3 (covers 1/8 to 1/4 or 18 percent), 4 (covers 1/4-1/2 or 38 percent), 5 (covers 1/2 to 3/4 or 63 percent), 6 (covers 3/4 to 4/4 or 87 percent). e.g. TBL_I-1, TBL_1-2, etc., where Roman numerals I through VIII correspond to the tables in Hanson (1953) and 1 through 10 correspond to the plot number. Column headings are the 80 table/plot numbers. The data values are species cover classes (modified Hult-Sernander cover-abundance scale) where: + (trace, 0.5 percent), 1 (covers less than 1/6 of the area or 4 percent), 2 (covers 1/16 to 1/8 or 9 percent), 3 (covers 1/8 to 1/4 or 18 percent), 4 (covers 1/4-1/2 or 38 percent), 5 (covers 1/2 to 3/4 or 63 percent), 6 (covers 3/4 to 4/4 or 87 percent). These data bring together for easy reference all the available information collected from the plots that has been used for the classification, mapping, and analysis of the geo-botanical factors in the region near Nome, Alaska. Derived regional maps of these data will be used in regional models of fluxes of trace gases, water, and energy from tundra surfaces. In addition, a circumpolar vegetation classification resulting from these data sets would be highly desirable to extend the results to the entire Arctic region. These data were originally collected as part of a classification of the major vegetation types during broader surveys for reindeer winter lichen range in northwestern Alaska. The work was funded by the Arctic Institute of North America with funds provided by the Office of Naval Research. Classification of the major kinds of vegetation was needed to show relationships between the distribution and abundance of lichens and the major vegetation types which could be readily distinguished on the ground or from the air. Hanson (1953) noted the similarities of the Alaskan vegetation communities to those in other arctic and sub-arctic regions, particularly Scandinavia. Sampling of tundra vegetation on the Seward Peninsula near Nome, Alaska was undertaken as part of a classification of the major vegetation types during broader surveys for reindeer winter lichen range in northwestern Alaska. The primary source document for this data set is Hanson (1953). In July and August of 1951, plant species data were collected from 80 subjectively located plots to align with methods used for vegetation sampling in northern Europe (Braun-Blanquet 1932). 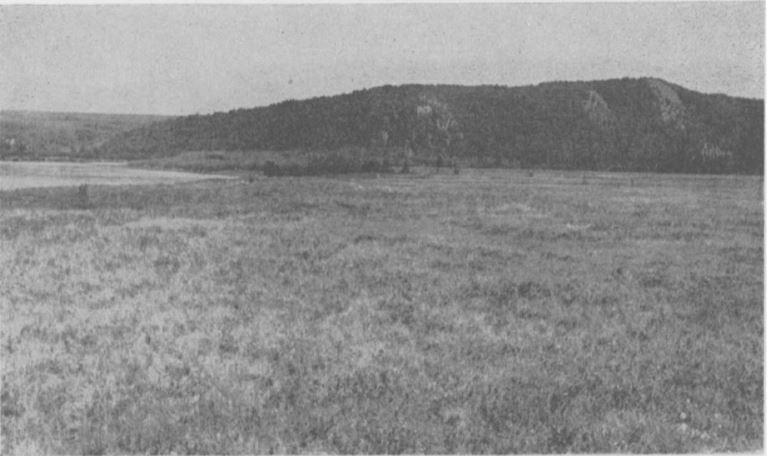 Within stands, ten 1-m2 plots were located at regular intervals on a line through each stand and species cover was recorded using a modified Hult-Sernander scale (Hanson 1953). Plant communities were found to occur in 5 broad habitat types including: Moist to wet acidic tussock and non-tussock tundra (Eriophorum vaginatum-Carex bigelowii-Sphagnum-Hylocomium; 10 plots), Dry acidic prostrate-shrub heaths (Arctous alpina, Salix phlebophylla, Empetrum heaths; 10 plots), shallow acidic snowbeds (Cassiope-Carex microchaeta-Hylocomium communities; 10 plots), moist and dry acidic dwarf-shrub heaths (Vaccinium uliginosum, Empetrum nigrum, Ledum decumbens, some Betula nana-lichen heaths; 30 plots), and dry acidic tundra (Dryas octopetala; 20 plots). Stands were not permanently marked and little environmental data was recorded, however select soil descriptions were included. Plot numbers in the environmental, soil, and species data files were assigned by their respective table numbers (Hanson 1953: Tables I-VIII) and plot numbers within the tables. Figure 2. Presumed location of vegetation plots observed by Hanson in 1951 near Nome, Alaska. Verbal descriptions from Hanson (2013) indicate that all plots were located within roughly 13 miles of Nome. Braun-Blanquet, J. 1932. Plant sociology. 439 pp. McGraw-Hill, New York. Hanson, H. C. 1953. Vegetation types in northwestern Alaska and comparisons with communities in other Arctic regions. Ecology 34:111-140. Walker, D.A., Daniëls, F.J.A., Alsos, I., Bhatt, U.S., Breen, A.L., Buchhorn, M., Bültmann, H., Druckenmiller, L.A., Edwards, M.E., Ehrich, D., Epstein, H.E., Gould, W.A., Ims, R.A., Meltofte, H., Raynolds, M.K., Sibik, J., Talbot, S.S. and Webber, P.J. 2016. Circumpolar arctic vegetation: A hierarchic review and roadmap toward an internationally consistent approach to survey, archive and classify tundra plot data. Environmental Research Letters. 11:055005. doi: 10.1088/1748-9326/11/5/055005.